Judith Grabiner has a fine book A historian looks back. The Calculus as Algebra and Selected Writings, MAA 2010, in which she explains how Joseph-Louis Lagrange (actually Italian Giuseppe Lodovico Lagrangia, 1736-1813) developed the derivative as algebra rather than with infinitesimals and limits. His method is more complex than my proposal in Conquest of the Plane (COTP) but his intuition is great. Grabiner also explains how Lagrange wanted to get rid of Euclid’s fifth postulate. This is equivalent to the property that a point can have only one line parallel to a given other line. The postulate is used to show that the sum of angles in a triangle add up to 180 degrees. With respect to the following diagram: take a line through B that is parallel to AC, and see how the angles α and γ are mirrored, so that α + β + γ = 180 degrees. Euclid: The sum of angles in a triangle is a half plane. This latter proof is very elegant but also creates a perpetual wonder: Howcome do the angles in a triangle cover a half plane ? And why does this depend upon the fifth postulate that caused so much discussion ? I always wondered whether it might be explained a bit clearer. Perhaps not as elegant but with faster acceptance and better retention. Let us try to see whether the fifth postulate can be replaced by another one with seemingly less dramatic portent. Three points not on a line define a circle. Alternatively any triangle can be enclosed by a circle. A circle can be defined by three arbitrary points not on one line. Any triangle can be enclosed by a circle. The angles of a triangle seem to completely exhaust the angular circle. However, angles are measured from the center of the angular circle. Let us draw the diameters from the corners through the center, which gives AA’, BB’ and CC’. We use the letters α, β and γ now for different angles. Scaled to the angular circle. Diameters drawn through the corners. There arise three inner isosceles triangles that use the same radius. The corner at A has angle ∠BAC = α + γ. This angle on the circumference associates with ∠BOC at the center (indicated by a tiny arc-sign) with the proper value ∠BOC = Arc[B, C]. 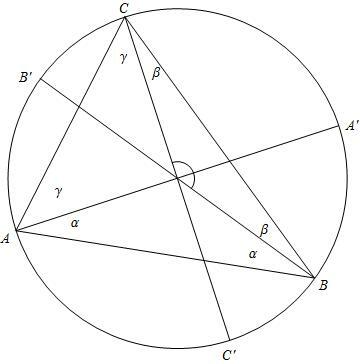 Similarly for the other corners B and C.
For the angles at the center we find ∠AOB + ∠BOC + ∠AOC = Arc[A, B] + Arc[B, C] + Arc[C, A] = 1. (1) It follows that the sum of the angles in a triangle equals that proportionality factor f too. ∠BAC + ∠ABC + ∠ACB = f (∠BOC + ∠AOC + ∠AOB) = f.
This also gives ∠BAC + ∠ABC + ∠ACB = 2 (α + β+ γ) = f.
(2) Secondly, we can apply the newly found sum rule to the inner triangles too. Adding these we find 1 + 2 (α + β+ γ) = 3 f.
With the above: 1 + f = 3 f, or f = 1/2. (3) The sum of angles in a triangle is 1/2. (4) An angle that lies on the circumference of a circle is 1/2 of the associated angle at the center of the circle. ∠AOB+ 2 α = Arc[A, B] + f (Arc[B, A’ ] + Arc[A, B’ ]). ∠AOB+ 2 α = Arc[A, A’ ] = Arc[B, B’ ] = 1/2 (a half plane indeed). (ii) It shows clearly where the factor f = 1/2 comes from. There is a neat distinction between angles on the circumference and the actual measurement at the center. (iii) Reversing the equivalences, we now have an elegant proof that a point has only one line parallel to another given line. Euclid’s fifth postulate has become dependent upon (*). (iv) Non-Euclidean geometry arises from adapting (*). When the axioms are applied to a sphere then a constant f = 1/2 doesn’t make sense. It depends upon the kind of non-Euclidean geometry what the replacement postulate would be. (v) Lagrange attached value to this discussion because scientists up to Einstein took Euclidean space also as a model for space itself. Grabiner op. cit. p261 suggests that ancient geometry was “the study of geometric figures: triangles, circles, parallelograms, and the like, but by the eighteenth century it had become the study of space (…ref…).” Her reference is to Rosenfeld 1988 ch 5. The implication would be that The Elements wouldn’t be a study of space as well ? I find this hard to believe – though I didn’t read that reference. It would seem to me that Euclid already thought that he axiomised a theory of space. A theory of geometric figures and their properties would not make sense if they were not conceptualised as being in space. That the theory implied ideas about space (like: a finite line might have any length) would be so obvious that it wouldn’t need mention. A fish in water would not speak about it. The Elements clearly isn’t a kosmology like the Timaeus. Given the importance of Plato, Euclid et al. likely regarded their findings limited to known space below the higher spheres, and they didn’t need to speculate like Plato on what lay beyond. This mental set-up still implies a theory of (known) space. The shift in the 18th century likely would be that Plato’s speculative kosmology fell away, so that Euclid’s known space started to apply to the whole universe. Be that as it may be, nevertheless, let me refer to COTP p195-197 for a discussion that Einstein might have been a bit ‘off’ on the issue of measurement error. It may well be that Euclid’s axioms actually define our very notion of space. At least, I find it impossible to think in terms of a “curved space” – i.e. I can imagine a sphere only as an object within Euclidean space. (vi) Let us return to the selection of postulates. Euclid’s approach might well be better than the alternative given here. The postulate of a single parallel line feels rather natural. The proof on the triangle is so elegant that it may well have highest impact. However, Euclid’s set-up is that the master selects the postulates and that we pupils follow his results. Nowadays we might adopt more daring didactics. (a) Indeed, start with the fifth postulate and use the elegant proof that the angles of a triangle add up to a half plane. Allow for the sense of wonder. (b) Discuss the alternative approach of assuming a constant proportional factor f, as above. (c) Discuss advantages and disadvantages. Then allow pupils their own choice. Indeed, this didactic structure has been used in this weblog entry. (d) Finally, clean up the mess. 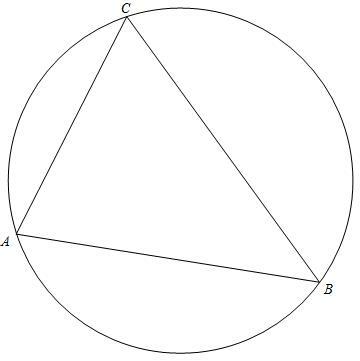 (1) In the first triangle, the corners were labelled clockwise to get the Greek letters in alphabetical order. The subsequent triangles have been properly labelled counterclockwise. (2) It would have been stricter if the isosceles triangles used indexed labels α1 and α2 but I opted for legibility. (3) Discuss the actual fifth postulate that Euclid used. Perhaps the original discussion about it was caused merely because of its needless complex format. This points to the rhetorical distinction between what is said and how it may come across. Tillack deals regularly with safety break users and emphasizes: “I have always judged information by its own value no matter who presents it to me. And I will continue to do so.” However, for many people the rule applies: Snowden had to be presented as serious before he passed the test for taking him serious. What if Snowden had made a weirdo impression, as impression only ? Wouldn’t the world have missed out on this debate ? The rhetorical problem is troublesome. I am inclined to regard people who take tests on people’s behaviour as weirdo’s themselves. I am a scientist, trained to look at content. It doesn’t matter how you look or how you speak. When I deal with you then I listen to what you say. Your words are tested, and I am not testing whether you are serious enough to listen to or talk with. A journalist preferably takes that attitude too. However, many a journalist has to make money from speaking with you. Whether you are to be regarded as serious or not will matter for the story and the proceeds. A story like “Mad Hatter Says NSA Bugs You” has a different flavour and market value than “$erious $nowden $hows N$A $ecrets”. I now include the $-signs that normally are suppressed in the actual headlines. Panel member Yves Eudes of the French Le Monde argued that news isn’t free and that people ought to go back to actually paying for it. This actually got a round of applause. In my perception science isn’t free either, but you pay for research and education, with professional standards that ought to give you value for money. I am critical of science and education, but I don’t feel that we should replace it with the free market. I have serious doubts about the media that operate in the free market. As explained before, a “free press” isn’t necessarily a “quality press”. Garrett Robinson (SecureDrop) showed his idealism and Alison Glick (GAP) showed her professionalism, all rather relying on donations and endowments than on paid circulation. 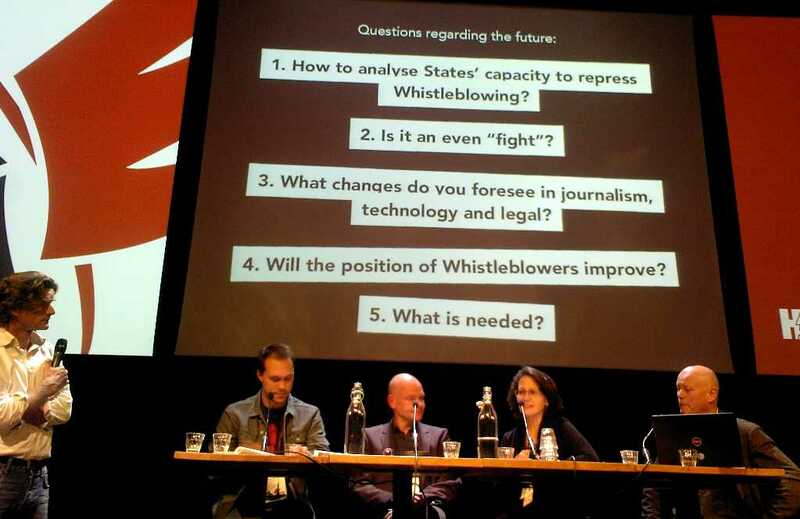 They completed the panel of an International Safety Break Users Conference – also known as Whistleblowers, (English) Amsterdam June 18, with moderator Teun Gautier of Free Press Unlimited. Better speak about “safety break users” rather than “whistleblowers”. A safety break is intended to be used in case of emergency, and safety break users normally don’t want to have the attention that a whistle gives. Scientists are supposed to speak but can get censored. Safety break users are commonly supposed to be silent but speak up. The mechanisms of social exclusion are somewhat the same. The media will regard you as a freak and you have to do an exam before you might be treated as a decent human being again. There is too much attention to the Snowden issue. His story sells well and is easy money for the media. The media should focus on the difficult stories and explain those to the readership. This will enhance the climate also for Snowden. The Iraq war still is a case in point. Patriotism killed media criticism. But George W. Bush announced the attack already a year before patriotism went high. There had been ample time for countervailing information. Internet and other information technology have all kinds of weaknesses, that are intentionally left there so that the NSA can use it. It is better to get secure software. However, we do need the NSA and surveillance. Thus we also need laws to deal with privacy and (inter-) national security. I have my doubts about this evening but perhaps some elements were helpful to make some steps forward. Importantly, the participants hadn’t heard before about the idea to boycott Holland, and some now have. Pierre Vinken (1927-2011) at this time of writing doesn’t have an English wikipedia article yet. He was chairman of Reed Elsevier, the publishing giant, so one can imagine that he is somewhat resistant to open source events. Vinken first became neurosurgeon, then editor of a medical journal Excerpta Medica, and the rest is history. Originally coming from Limburg in the South of Holland (see my earlier weblog on the North-South differences in Holland) he lived around Amsterdam and built up also a reputation in circles of artists and writers that caused positive obituaries, notably also from the otherwise so critical Max Pam (in Dutch). Vinken by chance also got a line in the circles of language programmers. However, there is also Eric Smit in Follow the Money (Dutch texts, English title). It turns out that Pierre Vinken was some kind of robber-baron, though all neat & legal in the Dutch system – or at least unless finally exposed in legal fashion too. My position in this weblog is that there should be a parliamentary enquiry into how the legal system allowed the transfer of some EUR 1.5 bn from the pension fund of Rotterdam harbour workers PVH to foundation BPVH to foundation Optas to foundation Inphykem. The latter Inphykem can do more things but has also created foundation Ammodo to give grants to arts and sciences (to present a fine image). As a science fiction writer I am reminded of Isaac Asimov’s Foundation series: there is great material here. The crucial legal step is from BPVH to Optas. Optas under Vinken widened the purposes of the fund, so that it seemingly wasn’t targetted at the Rotterdam harbour workers anymore but had a wider field of operation as a more general insurer. Henceforth it could claim that proceeds from its operation came from general sources and not from money originally put in by the pensioners. That the money was stolen can be established from the fact that Optas was willing to some “settlement” though legally it seemed they were not obliged to. Still, since they were not legally obliged to, the harbour pensioners couldn’t get all their money back. The “settlement” somehow meant that the harbour workers lost their right to protest. Somehow the Dutch legal system allows foundations to rechannel money, or, some notary allowed this to happen. Journalist Eric Smit records what lawyers from the Rotterdam harbour workers have tried to repair (so in a way there isn’t much investigative reporting here yet) but apparently the law is weak or those harbour worker lawyers have been goofing all the way. The failing worker at the FNV labour union is Agnes Jongerius who has now been elected to the European parliament. A parliamentary enquiry is an instrument for parliament to gather information for law making. Parliament could establish whether foundation law is too weak or whether some notary went wrong. It would seem obvious that the law shouldn’t allow this kind of seeming-legalised-robbery. Eric Smit points to the key role by Pieter Rietbergen, formerly director of foundation BPVH and by notary Steven Perrick, who worked for lawyers Freshfields Bruckhaus Deringer, which office also worked for Elsevier and thus Pierre Vinken. Steven Perrick is also special professor in Amsterdam and advisor to the Arnhem juridical court. It would be useful to hear their witnessing under oath and tough questions. The Ammodo foundation seems to be the cherry on the cake that allows the board members to act as filantropists and be treated with great respect by society. The Ammodo foundation collaborated with the Royal Dutch Academy of Sciences (KNAW) and six scientists protest that Ammodo was created with stolen money from the pension fund of Rotterdam harbour workers. The scientists are Joop Hartog, Kees Schuyt, Bernard van Praag, Kees Aarts, Philip Hans Franses and Martin Fase, all members of KNAW. Amusingly, their letter is behind a pay-wall at NRC Handelsblad. This is a text on the TU Delft magazine page. Their letter had no effect on the KNAW board. In the official KNAW statement the board holds that the “settlement” means that things have been settled. It is amazing that the board of Dutch top scientists does not allow for the possibility that the law was too weak or that the Dutch union of notaries KNB allows too much freedom. There is a system to this. Pierre Vinken first was editor at Excerpta Medica and then board member. This was a foundation too. Its board had full ownership, allowing him to sell out to Elsevier and becoming board member at Elsevier. Elsevier makes much of its money from “scientific publishing”. Much of this is “vanity press” under the label of science. Scientists like to see their names in print even though they need not have much to say and even though perhaps only one colleague is going to read it. Being editor of a journal allows for trips to foreign lands to discuss journal policy. The real work is done by authors and peer-reviewers. The money comes from universities, i.e. taxes, students and endowments. It is amazing how difficult it is to relocate to open source methods. 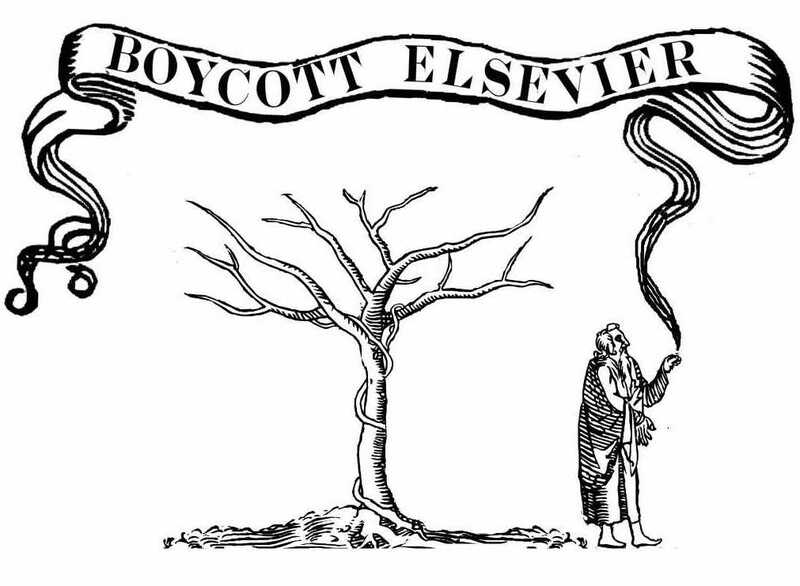 In 2012 Timothy Gowers had a boycott of Reed Elsevier. This is the wikipedia article and this is the original Cost of Knowlegde website. When I looked just now it had 14671 signatures. Mine isn’t on it. It seems somewhat useless. Scientists should direct their attention to their failing universities and institutes like KNAW, create their open access journals, revise the peer-review system. Free markets in publishing and printing are crucial but there can be tenders and the like. Overall, scientists should protest against the censorship of science. Even 14671 signatures don’t seem enough for that. Amir Alexander is a historian at UCLA and has written some books that have drawn attention. I haven’t read them but only summaries and some reviews. Alexander’s modus operandi apparently is: find a good narrative and weave history around it. The story sells, and history hitch-hikes along. Alexander recycles narratives and weaves history around it, and for some reason he has chosen mathematics to be his victim. Translate this as: A so-called “historical” tale relies on current (bad) education to sell well. Translate this: Brady fell into Alexander’s trap. Brady never heard about the distinction between Greek math and engineering ? Brady neither has the criticism on the math as given by Silver. Now in 2014 Alexander published this new book Infinitesimal: How a Dangerous Mathematical Theory Shaped the Modern World. (a) National Public Radio has a nice article and interview. Indeed, start by being nice, they aren’t that critical as I will be below. From Dirk Struik’s history of mathematics, I already knew that around 1600 most universities were quite conservative and that over the next century new academies were created for the new demands from society and trade and industry. Now Alexander reports that five leaders of the Society of Jesus convened on August 10 1632 and actually forbade the use of individibles (later giving rise to infinitesimals). Alexander claims that the Jesuits succeeded in keeping Italy in the Euclidean mold. What I regarded as common human conservatism thus would actually be organised. The countries that were relatively free from Rome also allowed for more freedom in mathematics, whence they discovered new methods, like the infinitesimal. Henri VIII (1491-1547) and his six marriages thus indirectly contributed to the creation of calculus. But also Grabiner falls in Alexander’s trap: “Nonetheless, the stories Alexander tells about these disputes are fascinating, and they deserve to be better known.” I would rather hold that the truth be known, and not the stories that Alexander tells. Alexander thus surprises me on the organised conservatism in Italy. But it seems that he puts too much emphasis on the power of organisation in other countries. Given such freedom, there still was room for good old common human conservatism that doesn’t need organisation. While Newton discovered calculus and derived his laws of gravity using calculus, he still presented his Principia with Euclidean methods. To see Alexander’s evidence I would need to read his book, but his modus operandi makes me wary. My fear is that I will just read a common narrative of freedom against tyranny, adorned with elements from the history of calculus to justify his job contract at UCLA. This is a crooked paragraph. Mathematics has always been free from the shackles of material reality. Mathematics namely is abstraction. Hippasus didn’t do what Alexander claims he did. A statement like “Modern … was born” is story-telling and an empty shell. Translate this as: Another victim fell into the trap. Note that infinitesimals were still a problem at the time of Cauchy. It is somewhat strange to have infinitesimals in the title when the story ends with limits. The true umbrella is the birth of calculus, but Alexander cannot tell that story, since he wants to focus on infinitesimals since the Jesuits forbade indivisibles. The general readership will be interested in the struggle of science against tyranny. To relive that same old narrative, they now are treated on somewhat crooked mathematics and somewhat crooked history of mathematics. People should be able to ask their money back if a book does not deliver what is promised. Of course, my book Conquest of the Plane shows that calculus can be developed with algebra, without limits and without infinitesimals. But I don’t give a money-back-guarantee, because traditionally minded mathematicians have shown that they don’t read well, see the earlier entry. mathematicians have been destroying democracy since Kenneth Arrow presented his “impossibility theorem” in 1950 / 1951, see my book Voting theory for democracy. all leading to Neoclassical mathematics for the schools. When you are mugged and call a policeman, and when that policeman protects the mugger, then you feel abused in squared fashion. I greatly enjoy the Jack Vance SF novels that project 19th century scoundrel stories into the far future, but it is quite a difference to be abused yourself here and now. The book Conquest of the Plane (COTP, 2011) re-engineers mathematics education. It uses the critique on traditional mathematics education given in Elegance with Substance (EWS, 2009). The PDFs are on their websites. Two book reviewers of EWS and/or COTP advised to read COTP with an open mind. A “review” by Jeroen Spandaw (TU Delft) however misrepresents the analysis and is slanderous. Spandaw rejected my suggestion to talk about is. A subsequent appeal to the TU Delft Commission on Scientific Integrity resulted in their decision in 2012 that book reviews are not at issue in the rules on scientific integrity, or alternatively that the supposed breach was so minor that it didn’t justify an effort to look deeper into the matter (with an actual investigation). An appeal to the national supervising integrity body LOWI of the Royal Dutch Academy of Sciences KNAW confirmed this Delft verdict in 2014. A report by Christiaan Boudri (Arnhem-Nijmegen) in 2013 was published after my appeal at TU Delft and before my appeal to LOWI. It reacted to Spandaw with the repeat advice to read with an open mind. The two integrity committees regarded this as too late for the original appeal at TU Delft, whence it had no impact, even though it was in time for the LOWI appeal. It is amazing that the committees on integrity of science think that reviews of scientific books are not part and parcel of science. When scientists discuss the works of other scientists (listed in their references) then there are standards of fair representation and common decency. Why would those standards not apply to book reviews as well ? Reviewing a scientific book isn’t science ? At no time the freedom of expression of a scientist is at issue here. If Spandaw is not convinced by COTP he is free to say so. At issue is only that you don’t misrepresent and slander and you don’t accept it from others. The best approach remains that others read EWS and COTP. It is unfortunate that there now is the added burden to have to think about whether you support the misrepresentation and slander or not. 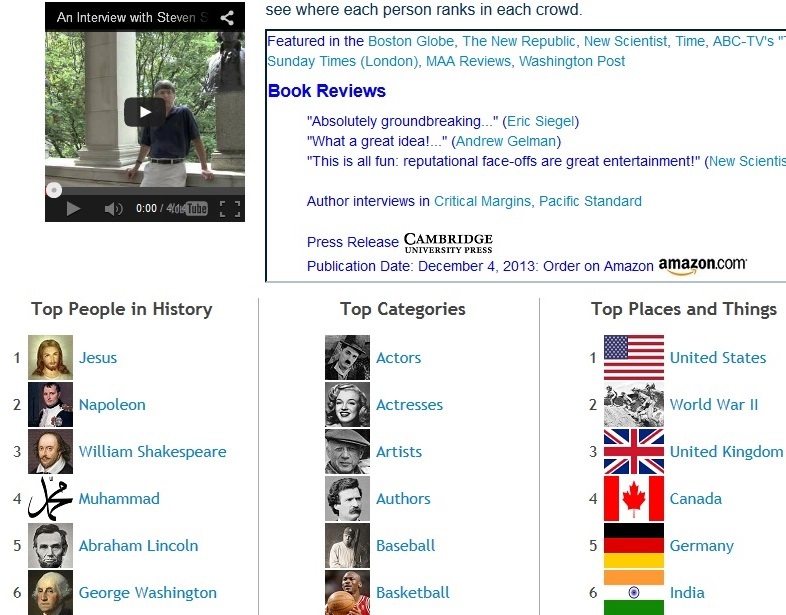 All this might perhaps be beneficial for the discussion on mathematics education. Mathematics education might be better than in the year 0 but is rather dismal compared to what is possible. More discussion of EWS and COTP will help to get an improvement. Traditional mathematics educators like Spandaw think that they defend quality but they close their minds to the wonderful results that are possible when we re-engineer the traditional lores that we teach our students. Europe is interconnected in amazing ways. I just discovered that the Finnish singer Arja Enni Helena Saijonmaa sang a Greek lament on the funeral of the Swedish Olof Palme. My Finnish correspondent reported earlier that his country suffers from the recession in Russia because of the Western response with respect to the Ukraine. It is amazing how Finland always suffers from problems in its big neighbour. Finland hoped that joining the EU would reduce fluctuations but now the EU causes it. I wanted to ask my correspondent for more details but he is incapacitated and needs rest for another reason. Looking for some internet links that might cheer him up, I originally found a recording by Arja Saijonmaa of Oli Dipsame – All are thirsty, performed in Holland 1972. I was already surprised by these European interconnections. Subsequently I found Arja at Palme’s funeral. But this will not cheer him up, I am afraid. Listen to her lament Einai megalos o kaimos – Such great sorrow, composed by Mikis Theodorakis. There appears to exist this touching recording of both Arja and Mikis in 1970. 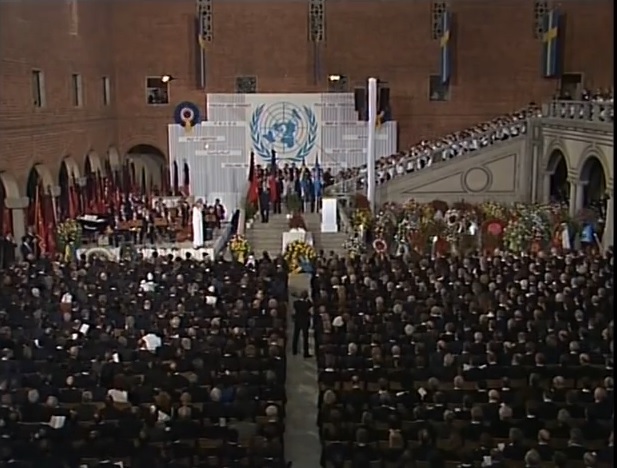 And here is the 80th birthday of Mikis that Olof would have loved. An earlier recording from 1995 of Mikis and Giorgos Dalaras with the Dutch Metropole Ochestra is also impressive. O Kaimos is a protest song against the dictators, but since freedom won it is sung with more joy than the lyrics indicate.